Home > Cat Stories > Yoda’s Adoption Story! July 2014, we had just arrived back in the States from our time living in France. While abroad I missed my cat – “Kitty” – so much. She was black and white like a little cow, and was super sweet and adorable. After six months of being away from home my family gave in and told me the terrible news: Kitty was no where to be found. I cried, a lot, thinking that leaving her was the reason she was now gone. One day while taking a walk through the countryside in Ardèche, France with Paul and his family, we come across a group of baby kittens. They all scattered, except for one who let me pick it up in my arms straight away. That little baby looked straight up into my eyes and touched my heart. It was dirty, flea-infested, snotty, poopy, and cold. I held it close to my chest, wrapped in my sweater, to keep it warm. Every time I would distance it from me it would start shivering. I didn’t want to leave it, but my situation at the time left me no choice..
From that day on I just wanted a cat of my own to take care of. But I knew it would have to wait until I returned home from France. It would also take a little convincing, too. Did I mention I was dating a “dog person?” Oh, right. We were back in North Carolina and at the time living in Greensboro, where I would finish my senior year at UNCG. One day we went shopping at Target when the PetSmart right next door was advertising $5 kitten adoptions. I was inside the doors before Paul knew what was happening. They were all playing around everywhere. You could pick one up and play with it. They were all spayed and neutered, so literally if I would have given over $5, one of them could have been mine. Almost too easy. But Paul wouldn’t have it. Being two travelers, he knew the cost of owning a pet. I didn’t want to hear it though. We left, me heartbroken. He clearly saw how much it meant to me to have a furry companion in my life again – since after all I did grow up with 25 animals. Less than two weeks later we, and my mom, went to visit my sister who lived in Johnson City, Tennessee. A day out for lunch and shopping really just meant lunch, T.J. Maxx, and then the animal shelter. Paul made it clear that we were not going to leave with a cat. We walked in. I saw one adorable cat. “No, look away, do not get attached” I said to myself. I passed several others. But then there was no use in changing fate. We walked through the door that led to “the cat room” and the first little face I saw stared back at me. That’s the one. I knew it. I walked straight to his cage without looking around. “Saul.” Definitely going to change the name, but yep, he is the one, I thought. Convincing Paul would be a task I wasn’t ready to face after my depressing failure at PetSmart. And plus to adopt this baby would be much more expensive as he needed to be neutered. But “Saul” helped me out a bit. He stuck his tongue out at us, he was incredibly gorgeous, and he purred when Paul held him. So imagine my heartbreak (yet tiny bit of hope) when we left – Saul-less. In the car I kept looking at Paul with huge puppy dog eyes. Grr. He wouldn’t budge. I then said, “Okay, fine. Let’s get him, but we can name him Darth Vader.” I said it as a joke of course, but I saw it got his attention. That’s when I said, “No, no,…..Yoda. Yeah…Yoda!” My mom and sister agreed. I thought it was perfect. He had bright green eyes at the time. We decided that if he was still there the next day, we would adopt him. I was so hopeful! My sister said there was even a Facebook page I could check to see which pets got adopted at the end of the day and who was still available at the shelter. So that night I checked their page. Other names of cats who were right next to “Saul” were displayed. But there was no Saul. It didn’t show that he was even there. The next day we went back and I tried to bottle up my hopes. Telling myself over and over not to get too excited because I might be let down in a matter of minutes. I looked through the glass door at his cage. There he was, staring back at me. Our baby all grown up! Have You Met Yoda Yet? Adopted from the Johnson City Animal Shelter in Tennessee. 10 weeks old at adoption. Blue/Gray fur. Green eyes. 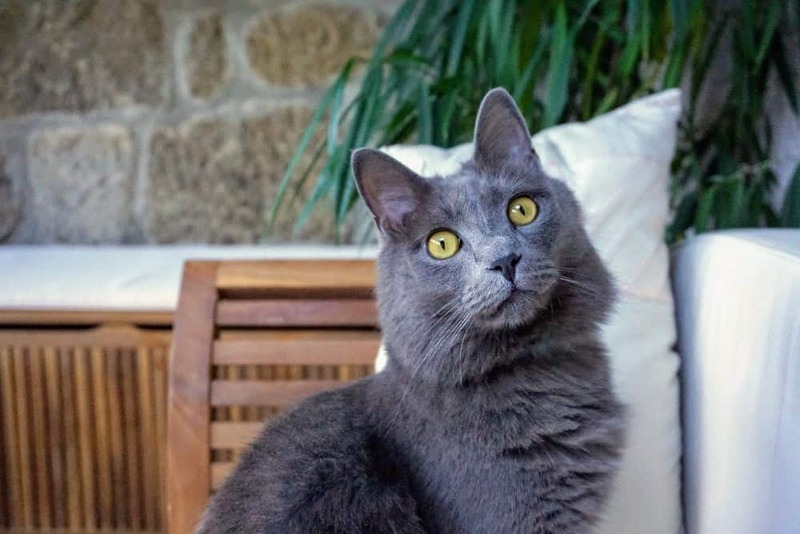 Character/Physical traits resemble that of the French Chartreux and the Russian Blue cats. When he was a kitten we thought Yoda would turn out to be a Russian Blue, but he is much fluffier than that and now has yellow eyes. He loves to watch the pigeons, travel in the car, go on walks outside and climb trees, curl up and sleep with his head upside down, give kisses on our cheeks when we come home, drink from the sink tap, play tag, fetch hair bows and elastics, and much more!!! 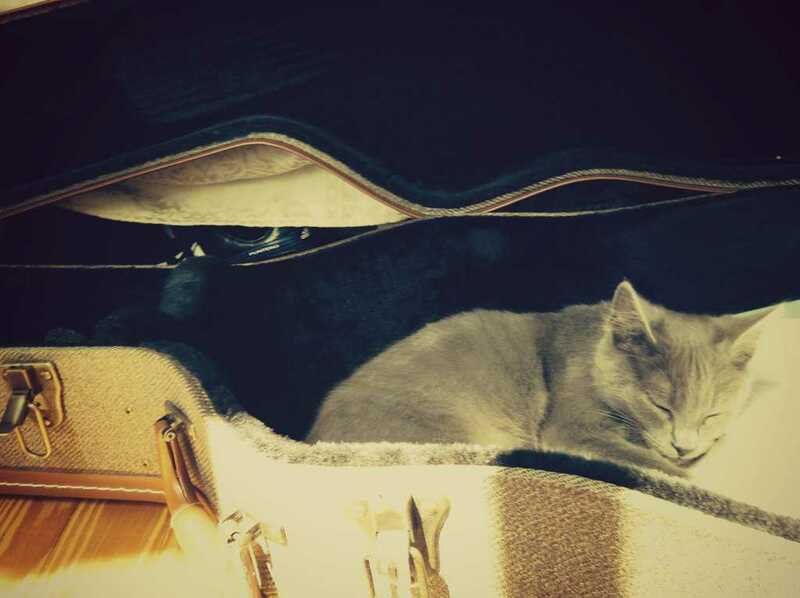 Yoda is the superstar and the raison d’être of this blog, Fluffy Kitty. Inspired by cats, for cats! Do you have an amazing cat story to share? Adoption story? Share them with us and we’ll be happy to feature your story right here on Fluffy Kitty!! Previous Post How Old Is a Cat in Human Years?